Brussels (French: Bruxelles, Dutch: Brussel) is the capital city of Belgium and of Brussels Capital Region. It is entirely surrounded by Dutch-speaking Flanders and its constituent Flemish Brabant province. As headquarters of many European institutions, Brussels might also be considered something of a capital for the European Union. Being at the crossroads of cultures (the Germanic in the North and the Romance in the South) and playing an important role in Europe, Brussels fits the definition of the archetypal "melting pot", but still retains its own unique character. The population of the city of Brussels is 1 million and the population of Brussels metropolitan area is just over 2 million. When Brussels became the capital city of a new country in the 19th century, many buildings in the old town were destroyed to make way for brand new ministries, palaces, schools, army barracks and office blocks constructed between 1880 and 1980. The historic Flemish town centers are better preserved in other cities: Antwerp, Bruges, Ghent, Courtray, Leuven and Mechelen. Brussels operates as a bilingual city where both French (85%) and Dutch (Flemish) (15%) are official languages. Thus all the streets have two names, which can sound totally different. For example, the Main Square is called both la Grand Place and de Grote Markt. Although officially bilingual, French is undoubtedly Brussels' lingua franca. English is also widely understood, but not always widely spoken. Visitors should realize that language is a very divisive issue in Belgium (though this is not as noticeable in Brussels). Historically Dutch-speaking, Brussels became more and more French-speaking during the 19th and 20th centuries. Today, most inhabitants speak French in daily life. Some numbers say that more than half of the inhabitants of Brussels do not speak French or Dutch at home. The Brussels dialect, a Brabantian dialect of Dutch, can be heard, especially in the outer districts of Brussels Capital Region. French speakers shouldn't have too much trouble understanding the local French. Dutch speakers may have some difficulty with the Belgian Dutch accent. English has become a common spoken language because of the international institutions based in Brussels, such as the European Commission, the European Parliament and NATO. It is still relatively rare to find written tourist or general information in English, although the situation is improving greatly. One can expect public announcements in train stations to at least be said in French and Dutch, while larger train stations (such as Zuidstation/Gare Du Midi) typically include English and sometimes German. English is also used on metros, trams and buses, announced last for information such as line transfers and terminal stops. Do not hesitate to ask someone if you do not understand what has been said. 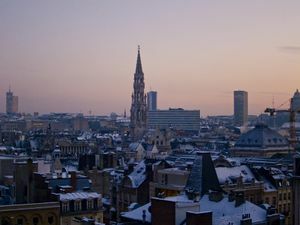 Brussels weather can often be grey and humid with a high and fairly evenly distributed annual average rainfall of 820 mm (32 in) and on average approximately 200 days of rainfall per year, both which are more than that of London and Paris. Summers tend to be cooler and wetter than London and winters colder. The daily and monthly temperature variations are quite small. Daily differences between average highs and average lows don't exceed 9ºC (16ºF). In the summer, maximum temperatures rarely reach 30ºC (86ºF) but can feel much hotter due to high humidity. The summer visitor should be prepared for rain. Warm and sunny weather is not constant during that season or even to be expected. After October, temperatures can drop off quite rapidly and winter months are often damp and chilly. However temperatures of 15ºC (59ºF) are not unusual into December. Snowfall is rare, and starts to melt fairly quickly, becoming slush on the ground. The winter visitor should be prepared for wet ground. Bruxelles/Brussel - Brussels encompasses many charming and beautiful attractions, with deeply ornate buildings on the Grand Place/Grote Markt, and a fish-and-crustacean overdose of St. Catherine's Square (Place St-Catherine/Sint-Katelijneplein). Stroll along, (and stop in for a drink) at one of the many bars on Place St-Géry/Sint-Goriksplein, or max out your credit card on the trendy Rue Antoine Dansaert/Antoine Dansaertstraat. Marolles/Marollen - A neighborhood of Brussels close to the city's heart, one of the few places where the Brussels dialect of Dutch (Flemish) could still be heard. The area is best known for the flea market held daily on the Place du Jeu de Balle/Vossenplein as well as a plethora of shops selling everything from old radios and bent wipers to fine china and expensive Art Nouveau trinkets. Visit on Saturdays or Sundays. Ixelles/Elsene - A vibrant part of town with a high concentration of restaurants, bars and other services to satisfy the good-looking or the heavy-spending. Some wandering around will reveal small bookshops, affordable ethnic restaurants or independent record shops tucked away in side streets. The Matongé district just off Chaussée d'Ixelles/Elsenesteenweg is the city's main African neighborhood. It is a large district in the South of Brussels spreading from newly gentrified immigrant neighborhoods off the Chaussée d'Ixelles/Elsenesteenweg near the town center to leafy suburbs close to the Bois de la Cambre/Ter Kamerenbos. The district is split in two by Avenue Louise/Louizalaan, which is technically part of the Bruxelles/Brussel district of the city. Molenbeek-Saint-Jean/Sint-Jans-Molenbeek - Commonly known as Molenbeek. A commune with a very large Moroccan and, lately, Romani (Gypsy) population. Saint-Gilles/Sint-Gillis - The city's bohemian epicenter with thriving French, Portuguese, Spanish, Maghrebi and Polish communities. The area around the Parvis de St-Gilles/St-Gillisvoorplein is the arty part, with the area around the Chatelain/Kastelein and the Church of the Holy Trinity being decidedly more yuppified. Like Schaarbeek, Saint-Gilles boasts several Art Nouveau and Haussmann-style buildings. St-Josse/Sint-Joost - The smallest and poorest commune not only of Brussels, but of all Belgium, this commune might not always be too pleasing on the eye but does have a few small, welcoming streets. The mid-part of the Chaussée de Louvain/Leuvensesteenweg is also home to a relatively small Indo-Pakistani community, so this is the place to head to for a tikka masala. The Turkish community which was the largest community only a few years ago has declined rapidly, as they moved to relatively wealthier communes by St-Josse/Sint-Joost standards. Uccle/Ukkel - Brussels' poshest commune. Green, bourgeois and starched like all posh communes should be. Uccle has retained many of its charming medieval cul-de-sacs, tiny squares and small townhouses as has nearby Watermael-Boitsfort/Watermaal-Bosvoorde. Woluwé-Saint-Pierre/Sint-Pieters-Woluwe and Woluwé-Saint-Lambert/Sint-Lambrechts-Woluwe are two communes at the eastern end of the city. Mainly residential, with a mixture of housing blocks, quaint neighborhoods and green areas this place is well-loved by Eurocrats and other professional types. The enormous Wolubilis cultural complex is well worth a visit. Brussels' main airport is Brussels Airport, (locally still commonly referred to as Brussels National or Zaventem) (IATA code: BRU). Several major carriers operate out of the airport, including the local Brussels Airlines, which is owned by Lufthansa. Brussels Airport has a luggage locker service (Level 0) where you can leave luggage for a fixed duration. The lockers say that you will have to retrieve your bags within 72 hours or else they will be removed, but they are actually moved to the room next door and stored until you retrieve them. This is a useful facility for people wanting to stow away big suitcases somewhere safe. The rate is €7.50 per 24 hours. You need to pay in coins, a change machine is nearby. Belgian Rail operates trains (2nd class: Single: €8,60; Weekend return: €14,60; 1st class: €10.30) every 15 min from the airport (Level -1) to Brussels' three main stations, with most trains continuing to other parts of Belgium. The journey to the Central Station takes 15-20 minutes. Tickets can be bought from vending machines (coins or chip credits only) or the train ticket office (notes accepted) located in the airport train station at Level -1. The trains are clean and well-maintained. To enter or exit the train, push the green button on the door, as the doors are not automatically opened at the stations as they are in other systems. Alternatively, Brussels can be reached by train much more cheaply via Zaventem village (dorp) station, which is within easy walking distance from the airport. At €2,90, the fare is three times cheaper than the ticket from Brussels Airport Station to the city. This is because the expensive Diabolo Surcharge on airport trains does not apply here; therefore, you can also travel this way using Go Pass or Rail Pass without need to pay Diabolo Surcharge. Zaventem dorp station is served by frequent local trains to all Brussels stations, taking roughly the same amount of time as the airport trains (15-20 minutes to Central Station). In order to reach Zaventem dorp station from the airport (~25 min walk), go to the bus parking on level 0 and walk towards the end of it, where the airport bicycle lane starts. Follow the airport bicycle lane (marked in red) through the small car park and along the highway for about 700 metres until the first crosswalk at the roundabout. Cross the road to the left and walk into the street leading into the village (Vilvoordelaan). Keep going straight ahead for another 800 metres until you reach the railway station's back entrance. Coming from Brussels, exit Zaventem station through the back entrance on the northern side (the left in the direction of driving from Brussels). Walk straight north on Vilvoordelaan for about 800 metres until you reach the airport highway overpass, where you cross under and turn right onto the airport bicycle lane indicated with 'Terminal'. Follow the 'Terminal' bicycle lane for about 700 metres along the highway until you arrive at the airport bus parking on level 0, where you can enter the Terminal. From Zaventem dorp you can also take Uber to the airport (~5.5€). STIB Buses #12 and #21 (#12 operates M-F before 8pm and is an express, serving only major bus stops (although it is not any faster); #21 operates after 8pm and on weekends, serving all stops on the route) run every 20-30 minutes via metro station Schuman (where you can transfer to metro lines 1 and 5) to the European district around Place du Luxembourg/Luxemburgplein (on the other side of the park from Gare Central). When boarding the bus make sure that the destination is Luxembourg, as some buses terminate at either the Schuman metro station or Gare de Bordet. The journey takes 30 minutes. The same ticket is valid for a total of 60 minutes on the trains (by SNCB), metro (by STIB), buses (by STIB, De Lijn and TEC) or trams (by STIB) from the moment it is validated. The buses depart from airport level 0. The ticket price is €4.50 from the vending machine next to the bus stop, or €6.00 on board. You can buy a Discover Brussels Card which costs €7.50 for a trip from the airport and unlimited metro usage for 24 hours. The card can be bought at the same "GO" ticket vending machine on the bus stop of #12/#21. Frequent travelers can buy a 10-trip ticket (€25.00), a monthly ticket (€49.00) or a yearly ticket (€514.00) for this line. The latter is valid on the entire STIB network. De Lijn Buses #272 and #471 run every 30-60 minutes to Brussels' North Station (called Noordstation/Gare du Nord within the city or Brussel-Noord/Bruxelles-Nord in other places), 2 km north of Grand Place. Night bus #620 operates to/from the airport with a stop at the IJzer metro station (45 minute ride), 1 km north of Grand Place. The buses depart from level 0 of the airport. The ticket price is €3.00 on board. In contrast to the tickets sold by STIB, these tickets (sold by De Lijn) are not valid on other means of public transport within Brussels. Taxis to the center cost around €35. Taxis bleus/blauw (blue): +32 2 268 0000, Taxis Autolux: +32 2 411 4142, Taxis verts/groen (green): +32 2 349 4949. Beware of "waiting" charges if your flight is delayed and you pre-ordered a cab, some companies charge you parking fees + €25-30/hour for waiting. Always confirm the final charge with your driver before getting in the car. It is not uncommon for drivers to rip you off and charge €80 to go to the center, especially if they realize that it is your first time in Brussels and don't know your way around. Car Sharing to the city center is one of the cheapest options from Brussels Airport. The major car sharing company at Brussels Airport is DriveNow, where they have their cars parked at P3 Holiday Parking. Just find the car you want and start driving it to anywhere in Brussels. A nice safe and convienient way to drive to and from Brussels airport. Ride Share to the city center hotels from the airport using Uber is around 30 euro. To get your first ride free, register on www.uber.com and use promo code 'uberinbrussels'. Uber is not allowed officially at the airport. However, there are some uber cars at the Sheraton Hotel Airport. Tinker offers bus transfers to the city center; prices are calculated by seat and they work with early booking discount. Transfers are available from €9,95. Brussels City Shuttle operates buses (between €5-€14 one-way, €10-€28 return if bought online; €17 one-way if purchased from the machines at the airport or from the driver) every 30 minutes to Brussels Midi/Zuid station, with a journey time of 1 hour (less on the weekends). Buying online is cheaper and faster. The bus stops at Midi/Zuid station (Midi/Zuid station PDF map), on the Rue de France/Frankrijkstraat in the west. The metro and international trains (Eurostar, Thalys) are on the west side of the station, so upon entering the station from the bus stop, head left rather than straight. When traveling to the airport, it would be better to arrive at the Brussels Midi/Zuid stop far in advance of the bus departure time as the queue to board the bus could be very long (there are no ticket machines and people buy tickets on board). Therefore you might miss the bus and wait another 30 minutes. Also note that the traffic on the way out of Brussels can be heavy in peak hours, so the journey may take longer than planned. TEC-bus A (€5.00 one way) operates service from the airport to the Charleroi South (Charleroi-Sud) train station, from where you can connect to an intercity train (€9.20 one way) to Brussels. A combined train+bus ticket to or from Brussels can be obtained for €14.20 from the TEC vending machine at the airport. The bus journey takes 20 minutes and the train takes an additional hour. Trains depart every 30-60 minutes. Taxis from the airport to the city center cost a fixed price of €90. For the return trip to Charleroi you can book in advance a Charleroi-based taxi (€90). Taxis operating from Brussels use a higher fare and will take you to the airport for a fixed price of €120 or based on the meter up to €170. Antwerp Airport (IATA code ANR) also has a good train connection to Brussels. 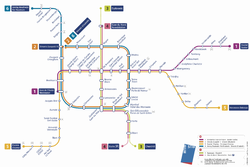 Brussels has three main train stations: Midi-Zuid, to the south of the city core, Central-Centraal, which is right next to the city center, and Nord-Noord, to the north of the city center (at Place Rogier). High-speed trains stop only at Midi/Zuid, except the ICE also stops at Nord/Noord. There is a shower at Midi/Zuid located in the toilet near platforms 19-20 (between Origin'O and Quick). When taking the train in Brussels, make sure to keep track of other travellers. Sometimes there can be track changes only two minutes before departure and no or barely audible announcements. Keep in mind that Brussels' central location in Belgium makes most trains pass through its South, Central and North stations. This makes for a lot of track changes, congestions and delays. Most sights in Brussels are fairly close together, within reasonable walking distance of each other. The oldest part of town can have uneven cobblestone roads, but the rest of the city is fairly easy to walk. Many roads in the old town are closed to cars. Brussels has many wet days, and in winter small amounts of snow can make the ground slushy, so water-resistant footwear is a must if you will be out walking all day. The metro in Brussels is quite clean and safe compared to most metro systems. Metro entrances are marked by big "M" signs in blue and white, with the station name underneath. All announcements are made in Dutch, French and English. There are 4 metro lines (1, 2, 5 and 6) and 3 "chrono" (fast) tram lines (3, 4 and 7). Single tickets, called Jump 1 cost €2.10 if pre-purchased and are available from the driver for €2.50 (only trams and buses, not metro). You validate the ticket in the small orange machines located in buses/trams, or at the entrance to metro stations/major tram stops. The orange machines time-stamp the ticket, both in ink and magnetically, and it will be valid for one hour. You can interrupt your ride and interchangeably use any STIB/MIVB transport. You should revalidate your ticket for each new ride. One ride paper card tickets (called Jump 1) are available at all metro and bigger train stations. They can also be bought from vending machines near major bus and tram stops. There is also a 1 day pass (called Jump 1 jour/1 dag) available for €7.50. These tickets can be purchased either at staffed windows or from kiosks. However, the kiosks do not accept many credit and debit cards and will only accept cash payments in coins. The five and ten ride tickets (Jump 5 and Jump 10 respectively) are no longer available as paper card tickets (they were withdrawn from sale on 1 July 2015, although existing part-used cards were still valid in October 2015). The Jump 5 (€8) and Jump 10 (€14) tickets must now be loaded onto a MOBIB or MOBIB-Basic smartcard (which costs €5). Be aware that the 10 ride ticket can be used by more than one person. Example, if two of you are traveling together, you can just buy one 10 ride ticket, and when you enter the bus, or metro or tram, you validate the ticket twice by entering the ticket on the small orange machine two times. As soon as the ticket is spit out, you enter it again, and the machine will say 2 person, and there will be two lines on the ticket to indicate this. if you know you're going to use public transport a lot, getting the 10 fare pass might be cheaper than getting individual tickets. Tickets that bear the name Jump are also valid on all SNCB/NMBS-trains and on buses run by Flemish public bus company De Lijn and Walloon public bus company TEC within the Brussels Capital Region. Brussels Bike Tours will take you on an easy (no hills) ride that lets you discover the city in just 4 hours. Villo runs a bike sharing network that has over 2,500 bicycles available at over 200 bike stations throughout the city. Users can take a bike from any station and return it to a different station. Membership fees are €1.60/day or €7.65 per week, payable by using a credit card with a smart chip at the automated kiosks attached to every station. On top of membership fees, usage fees vary, but the first 30 minutes are free. It is advisable to wear a helmet and a fluro vest (not mandatory). The bikes are robust, but rather heavy. A Brussels Card is available for discounts at many attractions. Available in 24 hr (€24), 48 hr (€36) and 72 hr (€43) versions, it offers a free guidebook, free entry to many museums, free use of public transit, and discounts at various shops, restaurants and attractions. May not be worth it to those who already receive discounts (children, students, etc). The card can be purchased on-line in advance for a discount, or at the tourist offices at: Grand-Place, Midi/Zui station, BIP. Some museums also sell the card. Parc du Cinquantenaire-Jubelpark - Definitely check out the Arc de Triomphe-Triomfboog on the east side of town. It's in the Parc du Cinquantenaire-Jubelpark. It is possible to go up to the terrasse above the arch, from where you'll have a good view of the city. Entry is through the Royal Museum of the Armed Forces and of Military History and is included in the museum entrance fee (5€, students 4€). Take Metro line 1 east, exit Schuman and walk east or exit Mérode and walk west. 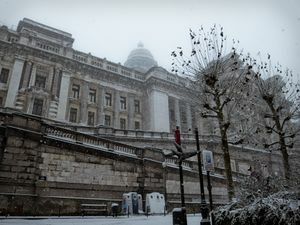 Brussels is considered to be the de facto capital of the European Union, having a long history of hosting the institutions of the European Union within its European Quarter. The EU has no official capital, and no plans to declare one, but Brussels hosts the official seats of the European Commission, Council of the European Union, European Council, as well as a second seat of the European Parliament. Woluwé-Saint-Pierre is a commune in Brussels. It is mostly a well-to-do residential area, which includes the wide, park-lined, Tervuren Avenue (French: Avenue de Tervueren, Dutch: Tervurenlaan) and the numerous embassies located near the Montgomery Square (Square Montgomery, Montgomeryplein). The imposing modern city hall is open to visitors. The town’s main church (Saint Peter) was erected in 1755 on the site of a much older building and perpendicular to it, with funds from the abbey of Forest. Traces of the older building can still be seen on the left of the current church. Several turn-of-the-century houses and manors can still be seen today, such as the Stoclet/Stokkel House, a UNESCO World Heritage Site, which was built between 1905 and 1909 on a design by Josef Hoffmann and contains mosaics and paintings by Gustav Klimt. You can see what's going on in Brussels by picking up a copy of local free city newspaper Zone 02. Another good free listings paper is Agenda, which is distributed together with the Dutch-language weekly Brussel Deze Week and has the notable advantage of being published in three languages (English, Dutch, French). Both of these are distributed in cafés and bars around the city. If you're looking for a good party, online listing Net Events (French and Dutch) and Ready2Move, are a good place to start. Brussels Agenda is the official cultural and entertainment agenda of the City of Brussels and the francophone Médiatheque has a website featuring the upcoming concerts in Brussels and the rest of Belgium. However, their listings page only features concerts Médiatheque staff are interested in. The most widely read English magazine is The Bulletin which, apart from covering Belgian and EU news, also offers arts and lifestyle stories, as well as in-depth events listings and a TV guide. Brussels has a fair number of cinemas, if limited compared to most European capitals. French films are subtitled in Dutch, and vice versa, all other films are shown in the original version subtitled in French and Dutch (on cinema listings look for 'OV'). Actors Studio and Styx, run by the cooperative nouveau cinema. Both cinemas screen interesting films in their original version with French and Dutch subtitles. Actor's studio, Petite Rue des Bouchers - Kleine Beenhouwersstraat, Brussels 1000, tel: 025121696 or Cinéma Styx, Rue de l'Arbre Bénit - Gewijde Boomstraat 72, Ixelles-Elsene. Cinema Nova  is an independent-to-the-bone cinema showcasing the more esoteric side of cinema - films which would not be shown elsewhere are generally shown here. A Korean Ultraman rip-off, a Pakistani documentary or a bleak Chilean cinema vérité flick? Only at Nova. Nova Cinema, 3 rue Arenberg-Arenbergstraat. Arenberg  is a good arthouse cinema with a well-programmed selection of films. Especially good for the newer arthouse flicks. Cinéma Arenberg, 26 Galerie de la Reine - Koninginnegalerij. Musée du Cinema/Filmmuseum  is part of the Center for Fine Arts and features a carefully chosen selection of contemporary and classic arthouse films. The best thing about this isn't just the building (due to be restored soon) but also the fact that the entrance fee is cheap. So if you can't live without your dose of Werner Herzog or Jan Svankmajer fret not - this place won't cost you an arm and a leg. Royal Film Museum, 9 Rue Baron Horta - Baron Hortastraat. Vendome, 18 Chaussée de Wavre-Waversesteenweg, Ixelles-Elsene. Another arthouse cinema. It's located near the Porte de Namur-Naamsepoort and acts as the metaphysical gateway to a lively african neighborhood known locally as Matongé. Flagey  is the old broadcasting headquarters and now houses the regional TV station TVBrussel . It labels itself 'the sound and images factory'. Quite an apt description - arthouse films, theatre pieces or world-renowned musicians are all featured here. Flagey, Place Sainte-Croix - Heilig-kruisplein, Ixelles-Elsene. UGC De Brouckère  - This is the most centrally located UGC in Brussels. Another UGC exists in Ixelles. As far as programming goes it's the usual Hollywood and mainstream European fare you'd expect from any other UGC in Europe. UGC De Brouckère, 38 Place De Brouckère - De Brouckèreplein. Kinepolis  was the first megaplex in the world. It's located at Heysel, near the Atomium, and has 25 screens showing a wide selection of mainstream films. BIFFF  is Brussels' international fantasy film festival (film fantastique in French). This two-weeks festival is scheduled yearly in March and is a must see for tourist and locals alike. Offscreen  is a showcase for unusual, independent and unreleased films, cult classics, extraordinary documentaries and offbeat genres from around the world. Takes place during the month of February and/or March in co-production with Cinema Nova and in collaboration with the Film Museum of the Royal Belgian Film Archive. Brussels has a good selection of year round events, many suitable for English speaking visitors. The following sites are are useful to check out what's on. Classictic Concerts  a site selling classical tickets, but has an excellent rundown of all the upcoming classical concerts. Wallonie Tourism  is brought to you by the French Speaking Tourist board. Ancienne Belgique  for popular concerts, where the stadium bands stop in. Brussels Events Listings  is a roundup of events for an English speaking audience, this is good for some of the the smaller and expat focused venues. The Paleis voor Schone Kunsten (Dutch) or Palais des Beaux-Arts (French) , Rue Ravensteinstraat 23, tel: 02 507 82 0, is often referred to as "Bozar" or "PSK". Construction was completed in 1928 and includes exhibition and conference rooms, movie theater and concert hall which serves as home to the National Orchestra of Belgium. The complex contains a large concert hall, a recital room, a chamber music room, lecture rooms and a vast gallery for temporary exhibitions. Since 2002, the Belgian federal institution has chosen the brand name BOZAR. It has seven artistic departments: Bozar Expo, Bozar Music, Bozar Cinema, Bozar Dance, Bozar Theatre, Bozar Literature, Bozar Studios and Bozar Architecture. Bozar Architecture is open to the public with exhibitions and lectures working in close collaboration with the Information Center for Architecture, Town Planning and Design. Bozar Cinema has showings of quality films for the general public, a special series for Young Film Fans (in the Henry Le Boeuf Hall), and cross-fertilising events that explore connections between cinema, video, and the other arts (Terarken rooms, Horta Hall). Bozar Dance hosts international contemporary dance productions. Bozar Expo has many exhibitions every year, in cooperation with the most prestigious international institutions, alternating the great collections with contemporary art, various national heritages, and support for young artists. Bozar Literature hosts meetings with Belgian and foreign writers. Bozar Music - concerts in almost a dozen venues, both at the Center for Fine Arts and elsewhere in Brussels, with Western classical music from the Middle Ages to our times, as well as non-European classical music, traditional music, jazz, blues, rock, etc., in a great variety of line-ups and genres, from chamber ensembles to big bands, from recitals to concert performances of opera. Bozar Theatre is oriented towards avant-garde theatre. Bozar Studios is the Center’s educational service, operating as an artistic department in its own right. Very few shops in Brussels open before 10AM, and most open about 10:30-11AM. Many shops are closed on Sunday and Monday. Brussels is chock full of chocolates, but the ultimate indulgence for the chocoholic is Place du Grand Sablon-Grote Zavel Plein, where you will find three shops selling some of the best chocolate in the world: Neuhaus, Pierre Marcolini and Wittamer. Each store has its own specialties: Pierre Marcolini's take-away cakes and ice cream are reasons to be tempted, while Wittamer is the only one with a cafe on premises and also sells the ultimate hot chocolate. Passion Chocolat (20 Rue Vanderlindenstraat) is a bit out of the way but its artisan chocolate is worth a visit, and you can taste lots of it for free at the entrance. There is plenty of good eating to be had in Brussels. Most people concentrate on the three classics: mussels (moules in French and mosselen in Flemish), fries (frites in French and frieten in Flemish) and chocolate. A few more adventurous Bruxellois/Brusselse dishes include anguilles au vert/paling in 't groen (river eels in green sauce), meat balls in tomato sauce, stoemp (mashed vegetables and potatoes) and turbot waterzooi (turbot fish in cream and egg sauce). For dessert, try a Belgian waffle (wafel in Flemish and gauffre in French), also available in a square Brussels version dusted with powdered sugar, and choices of bananas, whipped cream and many other toppings. Although many prefer the round, caramelized version from Liège. One shall however always bear in mind that it is important to check the prices of food items before ordering, just like what people should do when visiting pubs in France and Soho, London. Beware especially when servers make choices for you. It has been reported that tourists have to pay up to €7 for a litre of sparkling water, costing less than €0.70 in local stores. Visitors should also beware of the 'Italian Restaurant Streets' in the tourist and shopping districts. These streets are lined with small Italian restaurants, some offering "3 course meals" for just €12 or 13. They are all run by just a few shop owners and serve unappetizing store purchased food. They will not 'include service' as most all restaurants in Brussels do, and many tourists have reported getting scammed here, especially when not paying with exact change. A common practice is to present you a menu where prices aren't anything near the ones advertised in the windows. Be sure you ask why there is such a price difference BEFORE ordering and do not hesitate to leave if you do not agree with the price. If you were offered a drink and already sipped from your glass before receiving the menu (as is often the case) then just pay for the drink and leave. The matter over which establishment serves up the best frites (locally known as fritkots in Flemish and "friterie" in French) remains a matter of heated debate. Some argue that the best frites in Brussels are served at the fritkot near the Barriere de Saint-Gilles, while others defend St-Josse's Martin (Place Saint-Josse/Sint-Joostplein) as the prime purveyor of the authentic Brussels frite just as others claim Antoine (Place Jourdan/Jourdanplein) remains the king of the local french fry. No matter which fritkot you're at, try to be adventurous and have something other than ketchup or mayonnaise on your fries. Of the selection of bizarre sauces you've never seen before, "andalouse" is probably the most popular with the locals. Maison Antoine, Place Jourdanplein - tasty fries with a large collection of sauces situated on a square close to the European Parliament. You can eat your fries (frites) in one of the several bars/cafés that carries the sign frites acceptées. Vegetarians be careful. Fries are cooked in Beef fat. Although this place has a very good reputation which can be guessed from the long line of people waiting to be served, purists will tell you that is is certainly not the best place in town to get your fries. Chez Martin. The small nondescript fritkot plonked on Place Saint-Josse/Sint-Joost (Saint-Josse-ten-Noode/Sint-Joost-ten-Node) and run by the calm and affable Martin is a serious contender for the best friterie in Brussels. You can eat your frites at the nearby Cafe Gambrinus and wash them down with a pintje or two. Martin is closed since December 26, 2009. La Friterie de la Place de la Chapelle, Rue Haute-Hoogstraat (near Les Marolles/Marollen). Another personal choice for the best frites in Brussels: the big chunks of potato, fried golden, and served with the usual dazzling array of sauces. La Friterie de la Barrière, Avenue du Parc-Parklaan (just off the Barrière de St-Gilles/Bareel van Sint-Gillis). Golden and crispy frites - just the way they should be. This exterior of this fritkot also serves as mini-museum with several tracts, articles and other literature on the fronts and sides of the shack on the good ol' Belgian frite. Friterie Tabora, Rue Taborastraat 2 (near the Bourse). All natural frites with the widest selection of sauces available. It's open almost 24/7 and is a favourite among locals. Arcadi, Rue d'Aremberg-Aremberglaan 1B, just at the exit of "Galleries de la Reine", in the direction opposite to the Grand-Place - a quirky combination of old and new, the menu ranges all over the place but the reason people flock here is the selection of over 30 sweet and savoury pies (tartes). A slice big enough for a meal, served with salad, costs €7-7.50. Also current special of cafe & slice of pie for €5. Mamma Roma, multiple shops: Flagey (Chaussee de Vleurgat-Vleurgatsesteenweg 5), Chatelain/Kastelein (Rue du Page-Edelknaapstraat 5), Place Jourdan/Jourdanplein, cimetière d'Ixelles/begraafplaats van Elsene (chaussée de Boondael-Boondaalsesteenweg, 467), and other locations. Small pizzeria for eat-in (bar-style seating) or takeaway, sold by weight. Delicious crunchy base and some unusual toppings (one was spicy with walnuts, very tasty). Long queues but speedy service, deals available for pizza + drinks. Food Box, Rue Gretry/straat 47 (Brussels centrum)  Youthful, clean, no-fuss eatery with a selection of healthy and tasty dishes whipped up fresh using quality local ingredients by the establishment's friendly crew. Best time to drop in is after the lunch-hour rush. Sel et Sucre Creperie - Glacier, Avenue des Celtes-Keltenlaan, 4, near Merode subway station, Parc du Cinquantenaire-Jubelpark and the Arc de Triomphe-Triomfbloog. The fantastic crepes and friendly service makes up for the ordinary decor and just around the corner from the Arc de Triomphe-Triomfbloog. Open 12:00 - 22:00. Tapas Locas, Rue Marche au Charbons-Kolenmarktstraat 74. Crazy tapas, sensible prices. Some tapas include miniaturised Belgian favourites as well as the usual Spanish suspects. Brussels' tourist restaurant gauntlet can be found in Rue des Bouchers-Beenhouwerstraat, just to the north of Grand Place. The place has a very bad reputation for waiters imposing themselves on passers-by, luring customers into their restaurant and then cheating them. The authorities are aware of this, and are trying to take measures. Some restaurants may also tempt you with cheap prices for the menus, but when seated, the item on the menu happens to be unavailable, and you're forced to accept another, noticeably more expensive dish. Often, the exaggerated price of the wines will also compensate for the attractive menu. Knowing this however, you may be able to negotiate a better deal before entering. However, while you may feel that you have struck a clear deal, be extremely wary: the waiters have a wide range of tricks that will inflate the price. If you pay what you think you owe and then leave, a waiter will run after you. The best thing is to avoid the Rue des Bouchers; Brussels has many very good restaurants, with passable to good service, so there is no reason to visit this street. 'Restaurant Vincent, Rue des Dominicains 8-10, 1000 Brussels. A very attractive, old-style restaurant popular with Belgians themselves, with the cooking done in full view of the customers. The tiling adds to the ambiance. Scheltema, Rue des Dominicains-Predikherenstraat 7, +32 2 512 2084. Specializes in fresh and tasty seafood. Aux Armes de Bruxelles, Rue des Bouchers-Beenhouwerstraat 13, +32 2 511 5550. Closed Mondays. Basic honest food, including some very decent moules. Crowded, although worth the wait. Si Bemol, Bloemenstraat-Rue aux Fleurs 20, +32 2 219 63 78. Open from 7PM on till usually 5AM. Closed Sundays. Small but nice, friendly, of the beaten path local place. Lots of dedicated pictures on the wall from French and Belgian performing artists from the 60s and 70s. Basic honest Brussels and Belgian fare. Au Pré Salé, 20, Rue de Flandre-Vlaamsesteenweg (near St Catherine square), +32 2 513 6545. A former butcher shop, locals flock here for some of the best moules in town, sold by the kilo (figure on €24) and served up in half a dozen ways. Also serves the full range of other Brussels favorites. Le Beau Soleil, Rue Joseph Lebeaustraat 7 (Sablon area). This tiny restaurant (approx. 14 seats) looks like a violin workshop, so you sit next to all the tools and half finished violins. Unlike other Belgian restaurants, it is open from 9AM to 5PM (Mo-Fr), 9AM to 6PM (Sat,Sun), closed on Wednesday. The menu is small but really delicious. The atmosphere is informal and friendly. Les Brassins, Rue Keyenveld-Keienveldstraat 36, Ixelles-Elsene, +32 2 512 6999. Its crowd is mostly made out of young couples or students. Rich choice of beer, with more than 50 varieties on the menu, and good quality of food. 'T Kelderke, Grand'Place, 15 Grote Markt, +32 2 513 7344. €9-19 main courses. €8.50 Plat du jour. Well-made typical Belgian fare. Try the carbonnades à la flamande (Flemish beef stew) & mussels. Note that this place can feel cramped when full of diners. Les Chapeliers, Rue des Chapeliers 1-3 Hoedenmakersstraat, +32 2 513 6479. Just off the Grote Markt with reasonable prices and excellent food. Seems to be popular among the locals without full of tourists. Buddhasia, +3225129541. Nice place to eat Thai food. Also has a few dishes for vegetarians. at Jules Van Praetstraat/Rue Jules Van Praet, 16 1000 Bruxelles. Opposite the Bourse. With the Bourse to your back and McDs road on the right. Its in the lane on left [email protected]  Open from Monday to Sunday, food served from noon to midnight Saturday and Sunday, Lounge Bar open till 2 a.m. Reasonably priced. €5(for Soups) - 10€ - 13€ (for Main dishes). For detailed prices see the site. Lune de Miel, +32 2 513 9181. Some very tasty Thai and Vietnamese dishes served in a fine decor. Shamrock, +32 2 511 4989. Its exterior and misleading name belie a great range of individually cooked Indian food. Get to know the owner and he'll treat you like an old friend. Thanh-Binh , +32 2 513 8118. The restaurant is very popular amongst the Euroworkers and business types common in Brussels and serves good Thai food. It can get crowded and is often noisy but is well worth a try. Place Saint Catherine-Catherinplaats is also a popular area, and once the fish-mongering center of Brussels. While many of the fish shops have moved elsewhere, it is still home to many good seafood restaurants featuring lobster as a specialty. Jacques, Quai aux Briques-Baksteenkaai 44, +32 2 513 2762. An authentic old bistro, with a charming kitsch decor. Very good fish. Viva M'Boma, Vlaanderenstraat-Rue de Flandre 17, +32 2 512 1593. For real Belgian home cooking. Terrace in the summer. Brussels Resto, Place Sainte Catherine-Catherinplaats 3, +32 2 502 35 73. bet for quality food especially for its steak at acceptable prices. The menu is in Dutch and French which can cause difficulty in deciphering the specialties. Madou's Provence, Rue de la Presse-Drukpersstraat 23, +32 2 217 3831. Closed Saturday noon and Sundays. Innovative southern French cuisine at affordable prices. Chez Oki, Rue Lesbroussart-Lesbroussartstraat 62, Ixelles-Elsene, . French-Japanese fusion cuisine in a modern decor. The chef has worked for prestigious restaurants in Paris. Reasonable prices. L'Ultime Atome: Increasingly chic, but still just about affordable brasserie, serving tasty food and drink from breakfast till late. Place St Boniface-Bonifatiusplaats (off the Chausée d'Ixelles-Elsensesteenweg). Mano a Mano: Italian restaurant on Place St. Boniface-Bonifatiusplaats; Good food, not too expensive. L'Amour Fou: Similar to above located on Place Fernand Coqplaats. Dolma: Buddhist cafe/wholefood shop on Chausée d'Ixelles-Elsensesteenweg (It is on the right hand side, just before Place Flagey, on your way out of town). Les Brassins , Belgian-French cuisine, tasty and a real bargain. Belga Queen , Rue du Fossé aux Loups-Wolvengracht 32. A restaurant within an old, restored bank building. Has an oyster bar, gorgeous bathrooms (with strange stall doors), and a cigar bar housed in the old bank vaults. A good looking younger crowd seem to enjoy this place, and don't miss the offbeat restrooms. La Belle Maraichere, Place Sainte-Catherineplaats 11, +32 2 512 9759, closed We-Th. A classic fish restaurant. Very fresh fish and good old traditional cooking. Comme Chez Soi, Place Rouppe/Rouppeplaats. +32 2 512 29 21. Classic Michelin-starred restaurant. Les Larmes du Tigres (Tears of the Tiger), Justitiepaleis, de Wynantsstraat 21, +32 2 512 1877, closed Tu, . Upmarket and stylish Thai restaurant found just behind the Palais de Justice and better than most food found in Thailand. De Gulden Boot (la Chaloupe d'Or), 24 Grote Markt (Grand Place) - One of the most famous restaurants in Brussels, situated on Grand Place. Beautiful old building, but too much of a tourist trap. And even after a €200 dinner, you will get charged €0.50 to visit the toilet. Forget about eating out if you're strictly vegan(maybe at EXKI). There are some vegetarian restaurants that might cater without animal products though. Some small snack joints do make up vegetarian sandwiches on request. EXKI - Located all over the city mostly near the Metro stations. Like opposite the Bourse, at De Brouckere, near the Parlamentarium, Schuhman. Has good range of food for both vegetarians and non vegetarians. Nice soups and juices. Offers "Take away" too. Take away is cheaper than sitting in. Dolma - A very nice vegetarian buffet Monday till Saturday from 19 till 21h . Chaussée d'Ixelles-Elsenesteenweg 329. Reservation 02/6498981. La Tsampa - An organic/vegetarian shop annex restaurant , closed on Saturday and Sunday. Rue de Livourne-Livornostraat 109. L'Element Terre - Located in Ixelles-Elsene, L'Element Terre features an eclectic menu and wonderful, attentive service. Chaussée de Waterloo-Waterloosesteenweg 465. Saravana Bhavan - Located in Avenue Louise, Saravana Bhavan is an authentic South Indian restaurant offering tasty food. Rue Jourdan 10, 1060 Saint-Gilles. 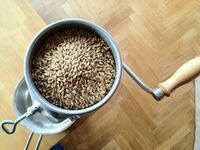 Belgium is to beer what France is to wine, it is home to one of the greatest beer traditions in the world, and Brussels is a great place to sample some of the vast variety on offer. 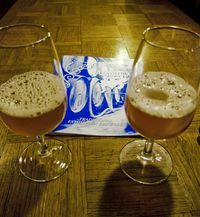 Typical beers of Brussels are gueuze (rather sour) and kriek (rather sweet, cherry based). Smoking is prohibited in all bars. A special drink only found in Brussels is the "half-en-half" ("half and half"). It's a mixture of white wine and champagne. À La Bécasse, Rue de Taborastraat 11, +32 2 511 0006. Serves a typical Brussels product this slightly sweetened Lambic beer, white beer based on Lambic, Kriek Lambic and so on. The entrance is not that easy to find. À La Mort Subite, rue Montagne-aux-Herbes Potagères-Bergstraat 7, . This is the Brussels cafe par excellence. Opened since 1927, the decor remains unchanged but still retains its charm. A warm welcome greets the eclectic clientile of which La Mort remains a firm favorite. Bier Circus, 57, Rue de l'Enseignement-Onderrichtsstraat, +32 2 218 0034, . Has an impressive selection of beers, including some extremely hard to find beers. Examples of rare beers they have in stock, are Lam Gods (a delicious beer brewed from figs) and the rarest of the Trappist beers, winner of the Beer of the Year 2005, Westvleteren. Also offers meals with beer as an ingredient. Open Tuesday to Friday, 1200-1430 & 1800-2300; Saturday 1800-2300. BXL Cafe/Bar, Place de la Vieille Halle aux Blés-Oud Korenhuis 46, +32 2 502 9980. Open daily noon-midnight (Fri/Sat until 1AM). A stylish, friendly internet cafe in the center of Brussels. Offering high speed internet access, occasional live music/DJ, latest movies shown on video screens around the bar, regular art exhibitions. Gay friendly space with women's night every Wednesday from 8PM. The Floris, Right across from Delirium Cafe, famous for its absinthe. Bizon Cafe, Rue Pont de la Carpe-Karperbrugstraat 7, . A relaxed blues/rock bar in St Gery area. Excellent place for a beer or five. The Monk, St Katelijnestraat-Rue St. Catherine 42, . A large proper brown bar with walls covered in dark wood and mirrors. Lots of young people from the neighborhood, cool music and a decent Malt whiskey selection. Delirium Cafe, Impasse de la Fidelité-Getrouwheidsgang 4A (on a pedestrian only side street), +32 2 514 4434, . Right in the center of Brussels within five minutes walk of the Grand Place. This bar is all about the beer, offering 2004 different beers from all over the world. They even hold the Guinness world record for most beers available! Popular amongst foreigners. Check if they have your own local beer. View their website for more info. There are some smoke-free areas. Also next door are three different alcohol themed bars specialising rum, tequila, and absinthe. Chez Moeder Lambic, Rue Savoiestraat 68 (behind Saint Gilles-Sint-Gillis city hall) or 8 Place Fontainas (a short walk from the Manneken Pis) . Has a huge list of different beers, with several hundred obscure beers not likely found anywhere else. This cafe is one of the last remaining old-fashioned brown cafes in Brussels. Le Greenwich, Rue des Chartreux-Kartuizerstraat 7, +32 2 511 4167. Another wood-paneled brown cafe where the only sound is the sound of the chess pieces on the chess board. Shh! Brasserie Verschueren, Parvis de St-Gilles-Sint-Gillisvoorplein 11-13, 02/539 40 68. Something of an institution in hip Saint-Gilles. Under the watchful eye of the portly, bearded deep-voiced owner, hipsters, starving artists and local poodle-brandishing ladies mingle and drink endless beers and coffees. A beautiful woodwork football tableau shows the scores of some long lost second and third division teams from yesteryear. Cirio, Rue de la Bourse-Beursstraat 18 (near the Bourse). A traditional café where time has come to a stop. Also offers some simple meals. Don't forget to visit the bathroom, with the original tiles and porcelain. Le Corbeau, Sint-Michielsstraat 18 (North of Debrouckere, near City2 and Inno) +32 2 219 5246. A bar with a strong selection of beer, Edgar Allen Poe themed, hence the name (The Raven). Known for the clientele who dance on the tables all around the bar. Reasonably priced, well trafficked. "Brasserie De l'Union", 55 Parvis De Saint-Gilles - Sint-Gillisvoorplein. This is a place with a true "atmosphere", wooden chairs and tables, big old wooden bar, a crowd that reflects the diversity of Saint-Gilles. When the sunny days are coming, the terrace is one nice to sit in. The Big Game, Rue Henri Mausstraat 5, 1000 Brussels (next to the Bourse, 2 minutes from the Grand Place). Longest Happy Hour: 12 hours every day!! They organize live concerts and DJs, show all sports on more than 20 screens (including one giant one), there are 2 floors for different atmospheres, free wifi, a great selection of Belgian beers and numerous different rums, tequilas, vodkas and whiskeys. De Walvis is one of the very few hip and non-smoking bars in Brussels. Dansaert street. Crystal Lounge  Inside the Sofitel hotel, in the the Louise district. Trendy, modern bar with restaurant and outdoor terrace. Mappa Mundo, Place Saint Géry-Sint Goriksplein 2, +32 2 514 3555. One of the many trendy bar/cafés located on the popular Place Saint Géry-Sint Goriksplein. You are assured good drinking in at least one of these establishments, which are very popular with younger Eurocrats, foreigners and interns, giving them a rather friendly cosmopolitan character. Le Tavernier, 445 Chaussée de Boondael-Boondaalsesteenweg , While all the above locations are situated downtown in central Brussels, this location is the most popular bar on a strip of bars right by the Cimétière d'Ixelles-Begraafplaats van Elsene. It's location right off the student campus make it extremely popular with students who just want to kick back and have a few relaxed drinks. Note on certain nights there is also live music (making the establishment a lot more hectic). Worth a look especially towards the beginning and end of the academic year and in the summer (especially for their Jazzbreaks nights). Hydra-breaks organises "Hydra Sessions" and also "Next Level" and "Caliente" drum and bass parties at various locations. Hydra Sessions are major D&B nights with international headliners such as Pendulum, Spor, or Raiden, along national djs. Bulex nights is a monthly night out for many locals since more than 10 years, blending all kind of music in unexpected venues. Come as you are. The Fuse Rue Blaesstraat 208 is a nightclub where it all started and is a Brussels institution. Be sure to check it out. Popular among the young people for it´s Electronic scene, often having Dubstep and Drum & Bass nights, such as Rockme On Electro, Cartel, F*ckin Beat or other parties. (Watch out for these other parties in nights spread out in other smaller clubs in Brussels). The Botanique is the place for rock and pop. They do, on occasion, bring more experimental acts. The Botanique's Flemish counterpart, the Ancienne Belgique features the same mix of rock and pop with the occasional excursion into more unchartered, experimental territory. Recyclart - For electronica, noise-rock, electroclash, minimal techno as well as art exhibitions, social projects and installations. Le You - For young clubbers who just want to party, 2 minutes walking due South-East from the Grande Place. Gays and Lesbians: the two biggest monthly gay clubs remain at La Demence at the Fuse. 100% House & Trance. Don't miss the crowded (but super small) Le Belgica bar, which plays house music. There are quite a lot of gay bars easily recognisable by their flag around the Grand Place area, especially on the street Marché Au Charbon/ Kolenmarkt. Underground music there's several good nightclubs such as FUSE, Bloody Louis and Stereo to name a few. Hotel rates in Brussels can vary widely (especially at the upper end) depending on how many EU bigwigs happen to be in town. Good deals are often available on weekends, and during the summer when the bourgeoisie go away on holiday. Sofitel Brussels Le Louise, Avenue de la Toison d'Or-Guldenvlieslaan 40; Metro: Louise-Louiza. Tel: +32 2 514 22 00, email: [email protected] . Fully refurbished in 2008 and located in the Avenue Louise-Louizalaan area. Parking nearby. Eurostar station five minutes away. Prices from €129. Hotel Metropole Brussels  - As the city's only 19th-century hotel still in operation, this 5-star landmark is in the historic center. 313 rooms and suites, fitness center, 12 meeting rooms, award-winning gourmet restaurant l'Alban Chambon. Stanhope Hotel  Rue du Commerce-Handelsstraat 9, tel +32 2 506 91 11, fax +32 2 512 17 08, [email protected] In the European district. Within walking distance you can find the main tourist attractions. 108 including 2 apartments. Radisson Blu Royal, Rue du Fosse-aux-Loups/Wolvengracht 47, +32-2-2192828, . Three minutes' walk from the Grand Place and the Central Station. Free Wi-Fi, fitness centre with sauna and solarium, restaurant "Sea Grill" has two Michelin stars. Le Chatelain All Suite Hotel, Rue du Châtelain-Kasteleinsstraat 17, +32-2-646-00-55, . This luxury hotel offers spacious suites, a beautiful garden and a rooftop health and fitness centre. Located in the Avenue Louise-Louizalaan area. Rates at this five-star hotel start at €89 per night. Although Brussels is the political capital of the EU, petty crime is quite common and these crimes don't make the statistics as either the victims don't report it, or the police don't take them seriously (A rather common occurence). There is little violent crime, particularly as far as tourists are concerned. It is important to be aware of your belongings and be aware of your surroundings. Many suburban neighborhoods have a very poor reputation, but most travelers are unlikely to visit them. The neighborhoods of Schaarbeek, Brussels North, St-Josse, Marollen, Anneessens, Molenbeek and Anderlecht are neighborhoods that should be avoided at night if possible, most often by inhabitants that do not live there. Between midnight and 6AM you should also be more attentive in the city center, particularly when walking alone. Pickpockets - by far the biggest issue - can be found in many areas of the city, especially in train and metro stations, and warmer days when tourists and locals love to sit outside to eat or have a coffee. You just need to take normal precautions against bag snatches. When traveling to Brussels by car, ensure to not leave any valuables while visiting various sites - particularly the Atomium, mini Europe and the Oceade area. Cars are common targets, and foreign license plates or goods on the (back)seat increase the risk of attracting undesired interest. In the evening and at night, dark areas such as parks attract drug dealers and addicts, pickpockets, and various other shady types. Travelers should avoid these areas after sunset, and be particularly alert for distractions aimed at diverting attention from their hand or shopping bag. Particularly popular at the moment seems to be the "soccer move distraction", when they suddenly stick their foot between your legs as if they are playing an imaginary soccer game. Be careful with laptops and electronics like smart phones, mp3 players and tablets on public transport. These items can be snatched out of traveler's hands during the short interval the doors are open at a stop, eliminating the chance for a pursuit. Or they will be taken from your pocket without you realizing it. The Main stations such as the North Station (Gare du Nord), Central Station, and the South Station (Gare du Midi), which probably has the worst reputation among the local residents, are hot zones for pickpockets. In the Parc de Bruxelles/Warandepark, between the Royal Palace and the Belgian Parliament, criminals have been noted threatening their victims with violence. Do not leave your bags unattended but keep them close to your body. If you are robbed, there is a police office right next to the gate in front of the Belgian Parliament (on the right side when leaving the park, hidden in the bushes) where experienced policemen will help you. Most of them speak French, Dutch and English well. However, police can do little to recover your goods, and will most likely provide you with a report for your insurance company. Due to the large number of daily cases, the Belgian police is not known for being the most helpful when it comes to recovering stolen goods, especially if these events occurred in areas known to be dangerous. In addition to the above advice be aware of Brussels Midi-Zuid train station, one of the poorest areas in the city. In other train stations, especially the North station, scam artists show up in groups trying to distract you with some questions and steal your belongings. They are professionals, and business travelers are often targeted, although anybody is a potential victim, especially if they have electronic valuables (smartphones), that can be easily snatched. Outside the central station, there are men with red vests asking for donations, or signatures, or trying to sell you some community paper. Ignore them if they approach you, or walk away from them. These individuals are very persistent and they will try to show you a badge to show that they are "legit", but if you stop to sign papers or give them a donation, another one will empty out your pockets. This type of scam is very common in many European cities. Like any city Brussels is home to a number of infamous street gangs, with the notorious Black Wolves being one of them. These groups operate outside the law, and employ violence against individuals as well as police officers. Another overlooked issue regards driving. Because of the often confusing urban planning of Brussels, most Brussels streets are small for a major city. What would be labelled a one-way street in Paris and London is usually a two-way street in Brussels. This leads to some of the worst traffic jams in Europe and aggressive drivers. It is not uncommon for people to not indicate when they are changing lanes or turning. Pedestrians always have the right of way. Waterloo - About 15 km South of Brussels. Visit where Wellington and Bluecher faced Napoleon for an ultimate battle that changed Europe's face forever. Further South, don't miss the Abbey of Villers-la-Ville. Mechelen - About 35 km NE of Brussels. Leuven - About 30 km East of Brussels. Antwerp - About 55 km North of Brussels. Liege - About 100 km SE of Brussels. Bruges - About 100 km NW of Brussels. Ghent - About 60 km NW of Brussels. Namur - About 60 km SE of Brussels. Tournai - About 90 km West of Brussels. Mons - About 70 km South of Brussels. This page was last edited on 11 March 2019, at 17:34.